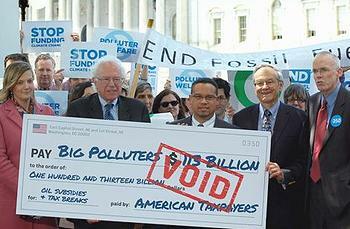 WASHINGTON, DC, May 10, 2012 (ENS) – Senator Bernie Sanders, a Vermont Independent, and Congressmen Keith Ellison, a Minnesota Democrat, today introduced a legislation to end billions of dollars in subsidies for the oil, gas and coal industries. The Sanders-Ellison End Polluter Welfare bill abolishes federal policies making Americans taxpayers pay for fossil fuel company investments. Under current law, more than $110 billion in federal subsidies would go to the oil, coal and gas industries in the coming decade. “We are here today not just to announce new legislation, but to send a message that it is time to end the absurdity of taxpayers providing massive subsidies to hugely profitable fossil fuel corporations,” Senator Sanders told a news conference outside the U.S. Capitol. “In these difficult economic times, it is imperative that we support the taxpayers of this country and not the fossil fuel industry – one of the most powerful special interests in the world,” Sanders said. “Big oil companies alone make more than $300 million every day but the oil, gas, and coal industries still have their hands in the taxpayer’s pocket,” said Representative Ellison. “Why should Americans prop up these companies with tax dollars and have to pay ridiculous fuel prices?” he asked. Sanders said the legislation he introduced in the Senate and Ellison introduced in the House ends all tax breaks, special financing arrangements, and the federal research and development funding for these industries. Environmentalists were pleased with the measure. Brent Blackwelder from Friends of the Earth, Ryan Alexander from Taxpayers for Common Sense, and Bill McKibben, founder of the climate action advocacy group 350.org, joined the lawmakers at the news conference.